Waves reaching heights close to 10 feet didn't prevent crews from working to repair the OB pier Thursday. OCEAN BEACH (KGTV)- Big waves continue to pound the coast today. A High Surf Advisory is issued until Friday afternoon at 1:00 p.m. Waves reached heights up to eight feet Thursday and along Ocean Beach Pier, some waves reached 10 feet. As we normally see during high surf, advanced surfers made their way to the beaches. 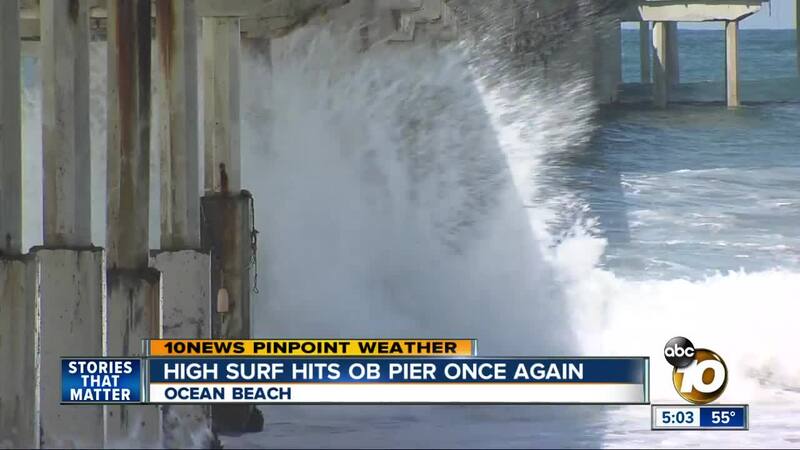 In Ocean Beach, crews continued their work to repair the pier despite the high surf below. Waves up to 10 feet crashed into the pier. One Ocean Beach resident tells 10News, "you know we spend all this money to live here and this is one of our facilities, it's sad when its closed". Crews are still on track to reopen the pier by Memorial Day, according to the City of San Diego.